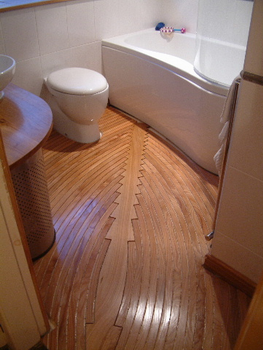 We will happily undertake flooring projects in either solid wood, engineered boards or laminate. We are suppliers of Pergo laminate flooring and accessories. Arguably the best and hardest wearing laminate flooring available – with warranty of up to 50 years! Hardwood floors are either fixed using hidden nailing, or are laid on high tech ‘liquid battens’. These allow seasonal movement of the timber whilst keeping it flat. Few things are as lovely as a large expanse of solid timber floor, but if it’s not laid correctly then catastrophe can result. We will always apply a damp proofing membrane to any concrete sub-base, and use properly fixed, properly seasoned boards, to ensure trouble free performance. Alternatively, for someone who wants something which is totally stunning we will provide highly specialised flooring such as the one in the accompanying image. This was made from steam bent planks of elm which were bonded to a carrier board, completely sealed with waterproof coating, then polished and fitted. Lastly, the gaps were filled with a marine grade deck caulking. This type of flooring lends itself to smaller rooms (predominantly due to cost) but can create quite a statement.